This is a post that myself and Ian should have made a long long time ago, and I’ll do my best to portray a fraction of the fun and events that occurred with some light captured from that day. Back in Late July a regular FCD:MP (Full Circuit Drift: Mallory Park) drift day at Mallory Park was advertised for the 24th of August – however – this time Bob, Mallory’s man in charge, unfortunately had to report this was likely to be the last of the FCD:MP days that would run at the venue due to a lack of attendees. 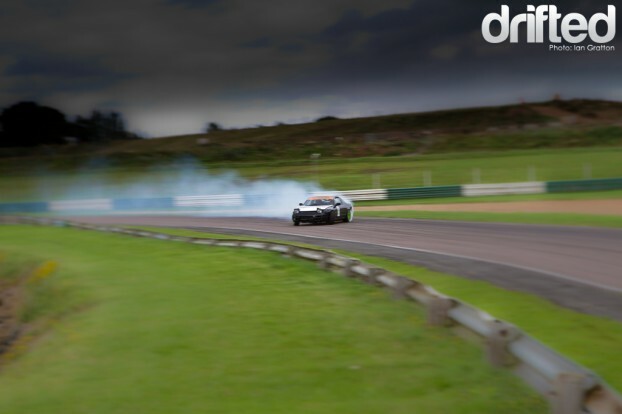 Getting race circuits to commit themselves to drifting in the UK is generally a hard task so it would be an incredible shame if this venue fell through as so many have over the years. A cry for help was posted on the Driftworks forum to try and rally together as many people as possible to make sure this day went ahead and also to help convince the circuit and organisers that the demand was still there. The response was huge and the event was filled to the brim – many people changing their plans so they could attend and show their appreciation. The day was set to be a great gathering so we decided we’d also do the same and try and get this amazing venue some much deserved attention. Mallory Park is situated in Leicestershire smack bang in the middle of the country. The circuit has a rich history dating back to the 1940s and has regular usage from many race championships and track days for bikes and cars alike. Pulling out of the pits you run the last third of the pit straight and enter immediately into the formidable Gerrards corner that runs over 180 degrees right round the edge of the lake that takes up most of the infield. The back section of the track runs up to Edwinas and then through the John Cooper Esses before a gentle climb up to Shaws Hairpin. There is a short little straight past a bus stop before the circuit drops sharp left though Devils Elbow and back onto the start/finish straight. Its really great fun. 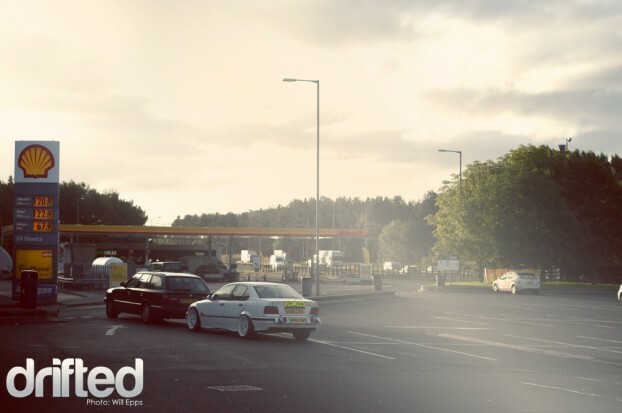 The day started early as I met Brad from Mutant Engineering and the rest of our crew at some services to fuel up the ever hungry drift cars with the V Power they deserve. Brad had a new weapon in his arsenal and was ready to abuse it within an inch of it’s life, the little E36 missile above was picked up for pennies and ready to be bashed, rubbed and tapped against any wall it could reach. We arrived pretty early to a near empty car park, then over the next 20 minutes or so cars started to fill the tarmac around us. Drivers and photographers all lined up and entered the briefing room to be told the usual health and safety, clipping points and all the rest, then it was time to hit the track. Which Brad did, with a vengeance. The poor little BMW popped it’s coolant after his first session of 4 laps of constant limiter abuse, surprisingly not through the cap though. The bottom hose had blown clean off which meant it was time to bodge, a few jubilee clips, zip ties, and plenty of gaffer tape later it was back out for more abuse. More interesting than the bodge itself was that for the rest of the day it ran without a fault on said cooling system. 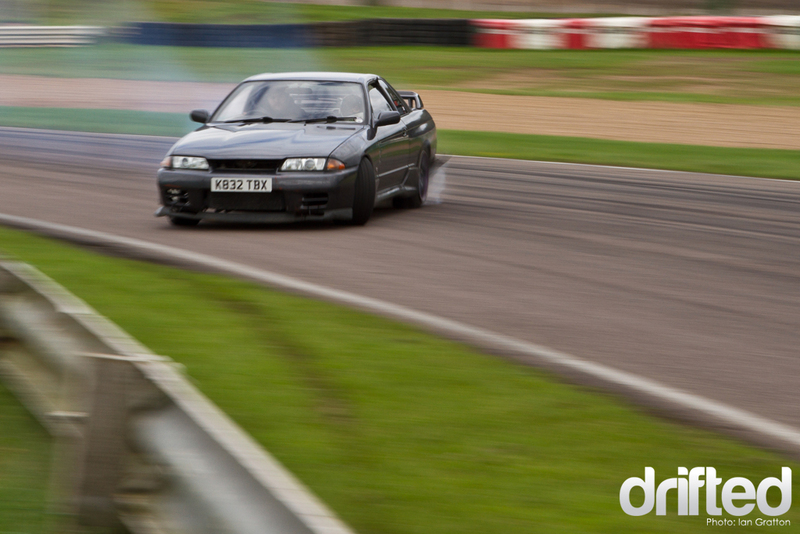 Rich Newton (Chunk) is no stranger to Mallory and from the off he was smoking up Gerrards in this borrowed R33 Skyline. Chunks confidence in this corner allowed him enough time to flip Ian the bird – its nice to see him driving more regularly nowadays as he has been plagued by medical issues with this left leg for a long long time. Chunk has a rather tasty 4Door R32 Skyline tucked away somewhere so I hope we get to see it in action soon. 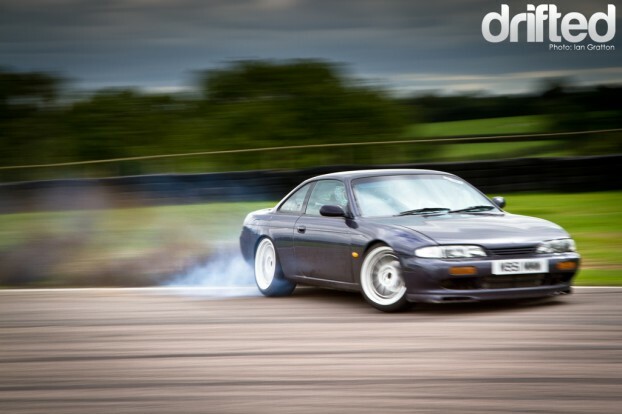 Paz and fellow members of the Driftworks crew graced us with there presence, showing how the dirt drop is correctly performed round Gerrards on the above shot from Ian Gratton, who joined me trackside and put his camera skills to damn good use. 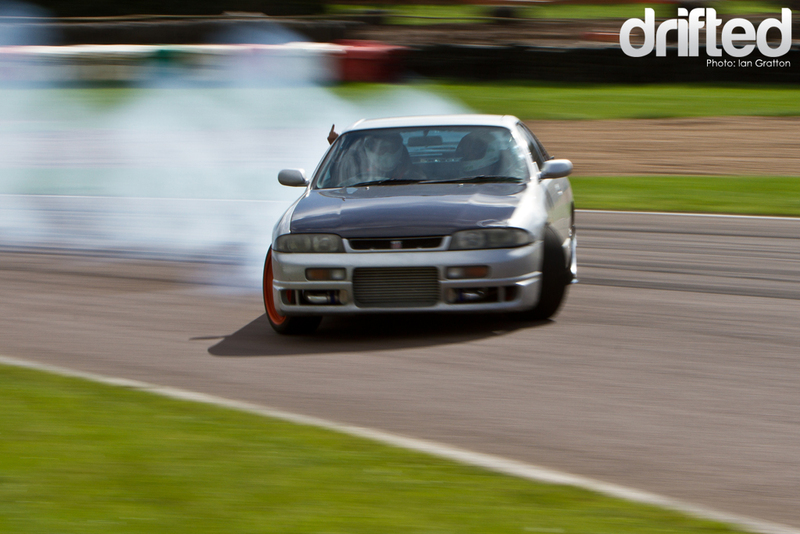 Another Team Night Spirit driver Kenny Lamb was firing his absolutely beautiful Toyota Chaser round the track. This is a real gentleman’s car and is still equipped with this all of its luxurious interior and creature comforts. The underside of the car paints a different picture as its kitted out with a serious suspension package, extra lock and a proper 2-way differential. I’m sure the longer Kenny owns this car the better it will become. 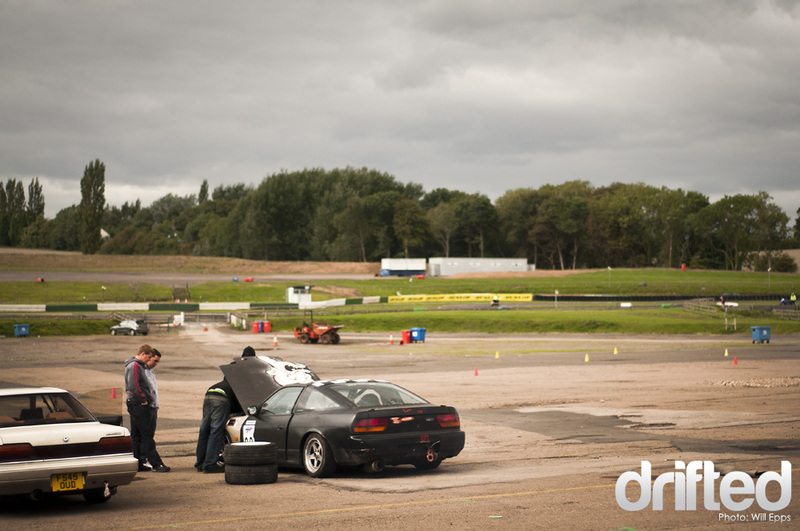 Team D:Mon’s Steve Carter was also smoking round Gerrards in his very tidy looking 180sx. From very early on in the day he was attacking hard with many years of drifting experience really showing. Its a shame the bus stop/chicane was in use at the bottom of Gerrards and I’m sure he would have made it the full length of the corner. Stuart Hansford was another that quickly got used to the fast entry speeds into Gerrards and was showing good smoke as soon as he came into slight from our vantage point mid way round the corner. 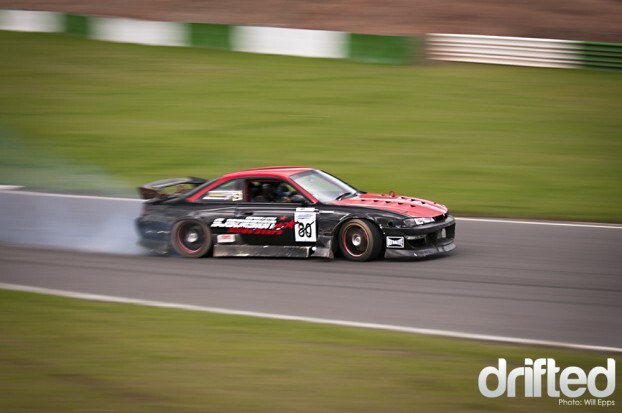 Stuart’s S13 is powered by a Toyota 1JZ engine and that power combined with a good few years drifting experience in the British Drift Championship saw him tackle the tricky Gerrards with a high success rate..
James McAllister’s R32 Skyline above had been doing really well all day. As you can see above tyres were not lasting especially long as the tread on the nearside tyre is trying to escape from the heat. Flapping tyre destroying paintwork could be heard right the way through the corner. 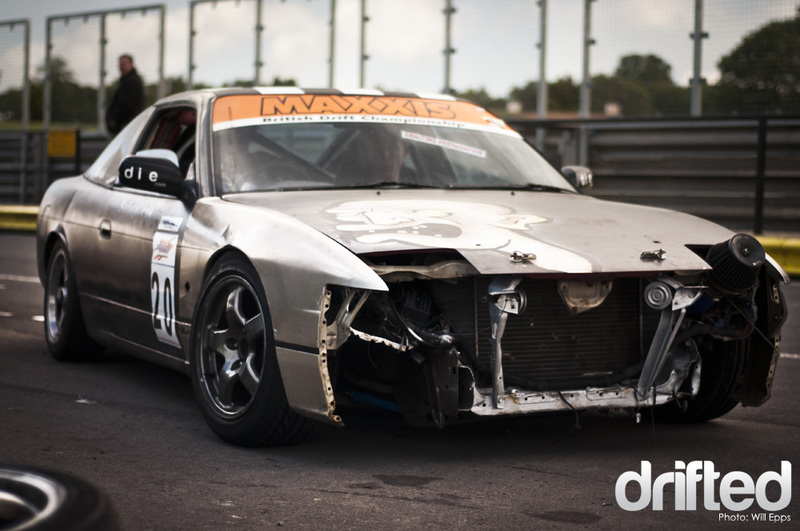 Tyres were taking a beating and later in the day Luke Fink blew a tyre clean off the rim of a borrowed missile car. 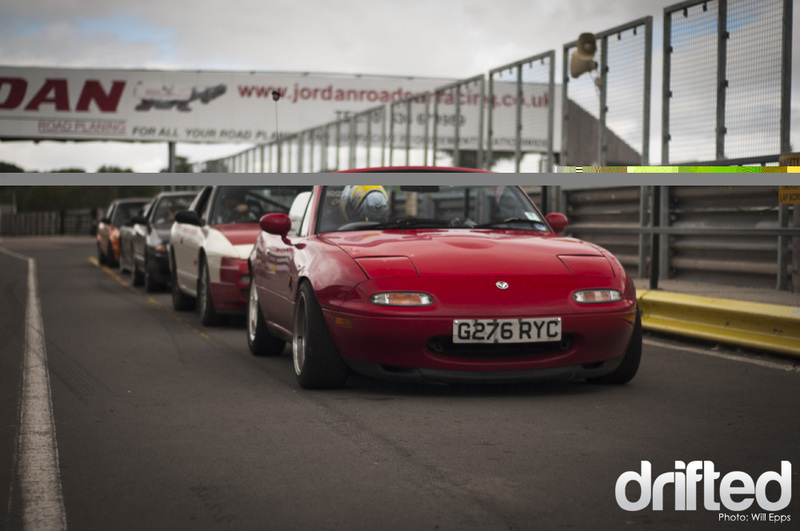 The track was at maximum capacity and a brilliant array of cars hard turned. S-bodies, MX5s, RX7s, Chasers, Laurels, Skylines, BMW’s new and old, when I say new and old, I mean brand new. 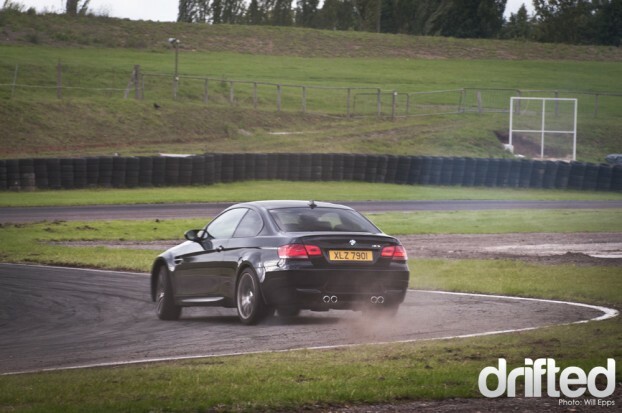 Drifted’s Ian Gratton took his pretty much brand spanking E90 M3 round for a quick spin, initially a strict “no drifting” couple of laps then turned into cheeky little skid session around the corners exiting Gerrards, naughty naughty! This is Dylan T’s 1JZ powered S14a, which I believe was a university project, if so it’s by far the coolest project I’ve ever seen. You could hear him belting it from the other side of the track, the screamer exiting from the wing (just above the Ultralite decal) provides the audience with without one of the best noises known to man, pure un-silenced 1JZ boost goodness; it makes grown men cry with a cocktail of joy, fear and utter amazement. Proving that outright power isn’t the only way to produce smoke was this little NA6c MX5, sweeping the entire length of Gerrards, into Charlies and on through Stapletons. It’s seeing things like this that makes everyone want an MX, myself included. Matt is really dedicated to drifting having slept in a tent at Santa Pod raceway after the practice day held the previous day. Many cars were missing various bits of body work, some from incidents with gravel traps, some with barriers (although thankfully not many), and some for function. 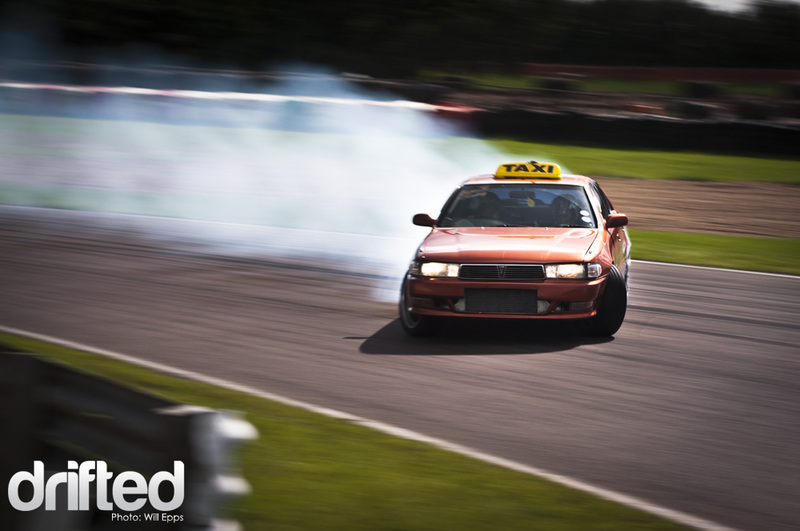 Karl was chucking out some crazy smoke in his Cresta drift taxi. Karl is also Buxton regular but its nice the see the Cresta stretching its legs more on a bigger circuit. 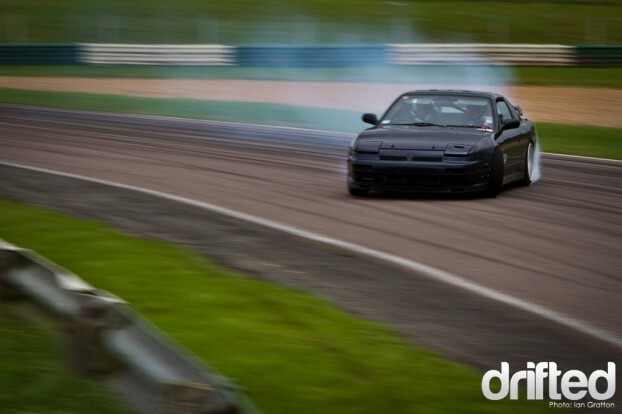 As were the Tramp Drift crew, getting plenty of angle for there moneys worth into Stapletons. Stew Noble (Now photosnapper for OMG Drift) turned up to take a few photos, as did fellow photo geek double team Daniel Bridle and Josh Allen. Who float from location to location, rarely touching the ground whilst others take photos, it took a while to stop them posing like mere walking mortals for this shot. 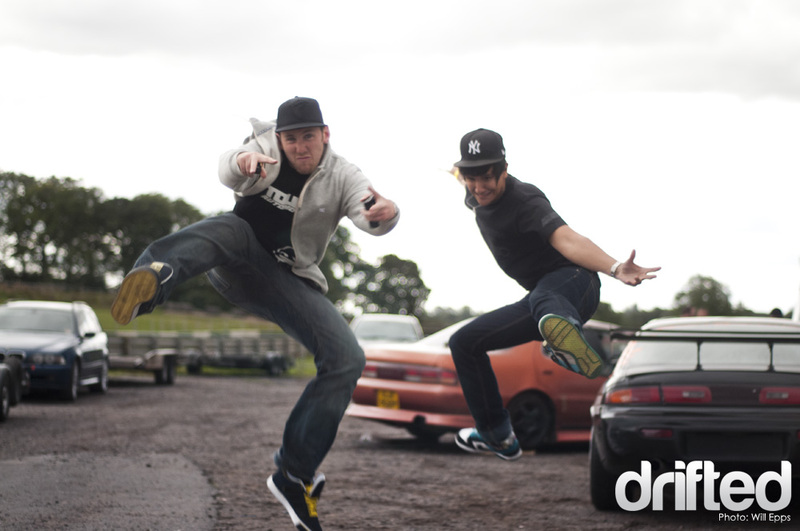 Dan Chapman (above on the BMX) and Luke Fink were available for tuition all day, and in exchange for a trip around the course in your car they were more than wiling to shout various instructions at you, along the lines of “POWER!”, “TURN!” and “HANDBRAKE!”. 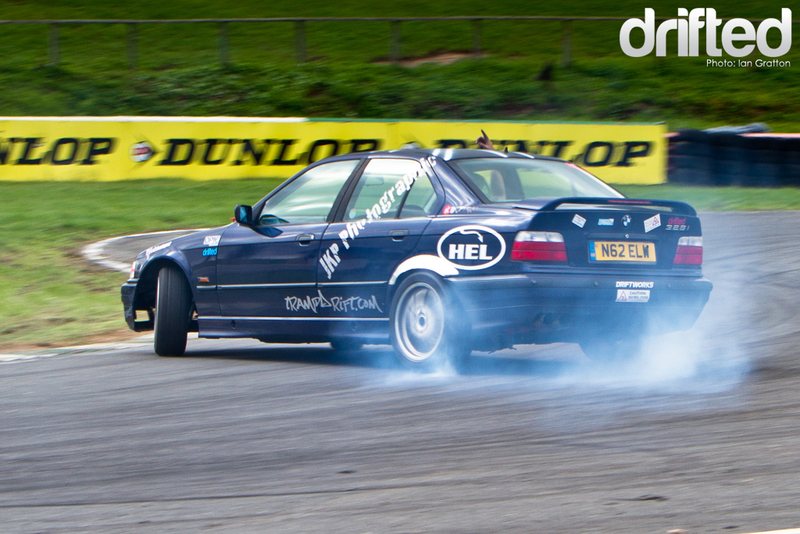 You may think this is a cheap way of being taught by the best, but don’t forget they win events by burning out a set of tyres in three or four runs maximum, if given half a chance they’ll do the same to your treads. As the light started to die down the tyre smoke started to diminish and people started filtering off one by one, until there were just a few remaining. I think everyone came away with a really good feeling from the day, There was a really nice relaxed atmosphere and everyone had lots of fun. 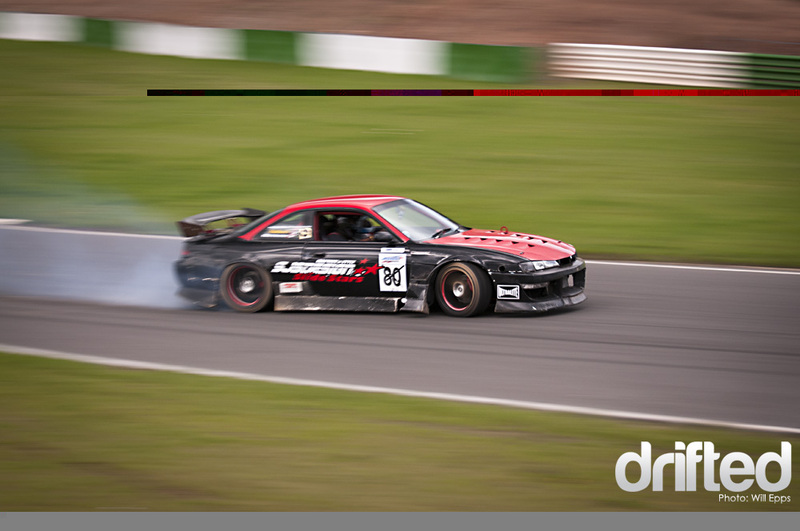 Spectators took rides in some of the cars to get their first experience of drifting – and with a corner like Gerrards there is really no better place to be robbed of your drift virginity. 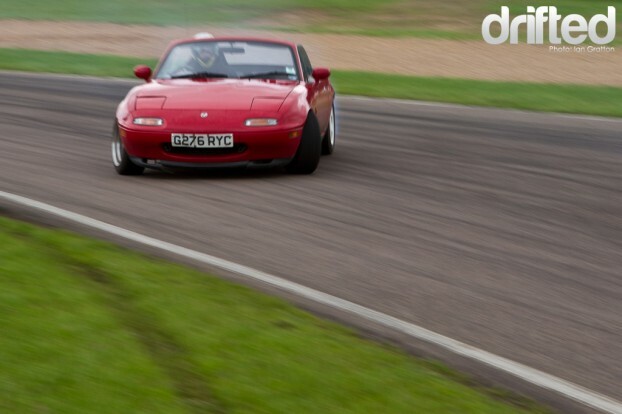 There is no pressure to drift the entire circuit which allowed for less experienced drivers to find their feet in the lower speed corners before building confidence for the more demanding bends. The day obviously had a positive effect on the future of events and Mallory park and drift days have been running once a month like clockwork. It just goes to show there is enough care and enthusiam within the UK drift community to keep things going strong. 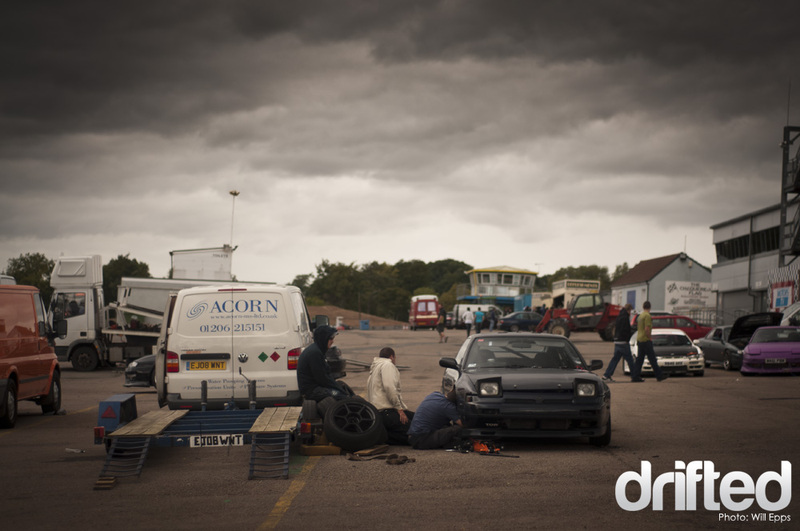 Driftworks have also recently announced their AwesomeFest event that will be taking place at Mallory in July 2011 so be sure to keep a space in your diary. The next event to be held at Mallory Park is on the 16th December. We hope to get back to capture more of the great action at this venue.